An excellent week in a fantastic location. 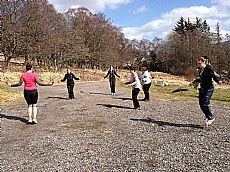 The level of exercise was of a higher intensity than other boot camps that I have attended (which usually involve more lengthy hill walks) which suits me. We were also fed enough during the day to fuel us. The PTIs were awesome and Kate was an absolute godsend. I'd definitely consider returning in the future. (Wendy's 5th boot camp, she lost 4.5lbs and 8.5 inches, June 2010).